Heavenly Bamboo Plants are completely unrelated to Bamboo. and the cane-like growth pattern of the plant. Heavenly Bamboo is classified as an evergreen shrub, but it will lose it's foliage and the canes may die back to the ground at -10°, but they will come back readily the next spring. What makes Heavenly Bamboo special is the color it provides in the garden during all four seasons of the year. 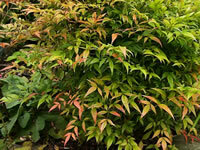 In the spring, the new foliage emerges as bright bronzed red, and is soon followed by large, six to twelve inch panicles of creamy white flowers early in the summer. As the seasons change, the foliage changes to a bluish green, then fades to a light green. Clusters of bright green berries replace the flowers and by late summer the berries will ripen to a bright red. In the fall, the foliage color again begins to change to shades of pink and red, ending the year with bright red leaves and berries. The berries will remain until they are discovered and enjoyed by the local birds. which makes it an excellent choice for entryways, patios or foundation plantings. Multiple plantings of Nandina can be used as a screen or hedge. Heavenly Bamboo is also suitable for growing as a container plant in your home. The flowers of Nandinas attract bees, the berries will attract mockingbirds, cedar waxwings, and robins. Once established this is one of the toughest plants you'll find, adapting itself to a wide variety of conditions. 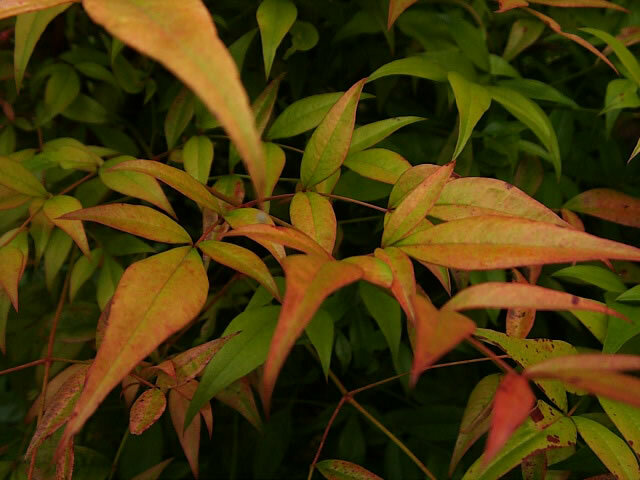 Nandina can be grown in partial shade, but the foliage colors will be much more intense if it is grown in full sun, with a little shade in the hottest part of the day. Select a location that is protected from harsh winds. Heavenly Bamboo should be planted in a reasonably rich acidic soil, with a pH Range: 3.7 to 6.4. Preferably the soil should be kept moist at all times, but well established Nandinas will survive periods of drought quite well. 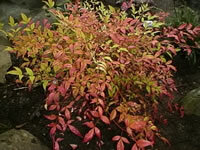 Nandina should be planted (or transplanted) during the cooler months of the fall. Careful pruning produces much denser growth. Pruning should be done in the spring by removing the oldest branches and any weak growth at ground level. You can safely remove up to 1/3 of the canes. It is possible to grow Heavenly Bamboo from seeds, but germination can take several years. It is better to increase your supply of Nandinas by taking softwood cuttings from new growth during the warm weather.